A passenger on a flight from Houston to Washington D.C. has accused United Airlines of giving her first-class seat to U.S. Rep. Sheila Jackson Lee. D-Houston, and then threatening to remove her from the plane for complaining and snapping a photo of the Houston congresswoman. 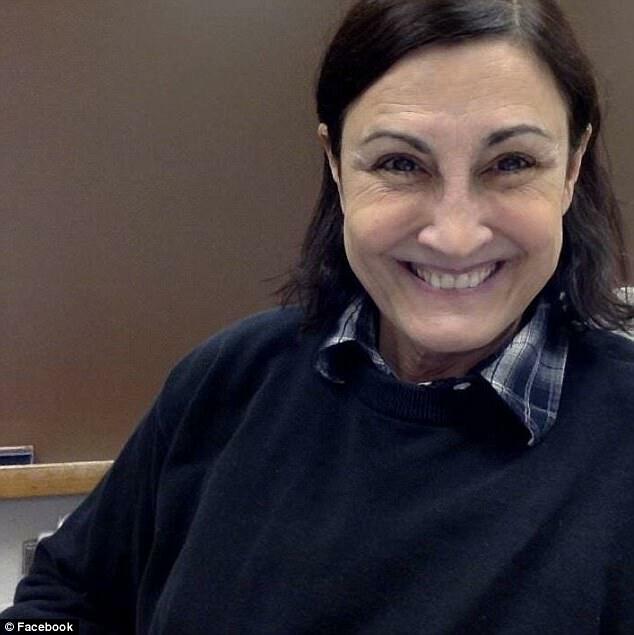 When it came time to board the last leg of her flight home from George Bush Intercontinental Airport on Dec. 18, after a roughly hour-long weather delay, Simon said the gate attendant scanned her paper ticket and told her it was not in the system. Did you cancel your flight?, the attendant asked. "No," she said she replied. "I just want to go home." Her seat, 1A, was taken, she was told. Simon was given a $500 voucher and reseated in row 11, Economy Plus. 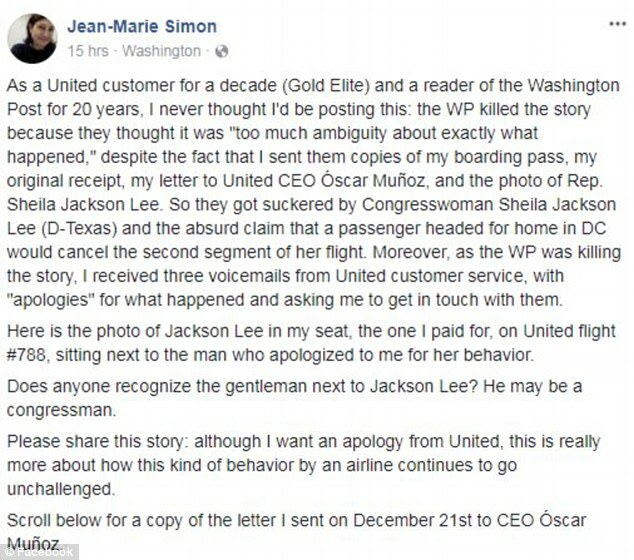 Simon later learned that Jackson Lee was in her pre-purchased seat and has alleged that the congresswoman received preferential treatment, which United denies. "After thoroughly examining our electronic records, we found that upon receiving a notification that Flight 788 was delayed due to weather, the customer appears to have canceled her flight from Houston to Washington, D.C. within the United mobile app," United said in a statement. "As part of the normal pre-boarding process, gate agents began clearing standby and upgrade customers, including the first customer on the waitlist for an upgrade." Simon denies that she cancelled her ticket. She sent a reporter a screenshot of the United website showing only one "inactive" reservation – a flight to Houston in August to visit her daughter that she had to cancel because of Hurricane Harvey. A United official said screenshot doesn't show the December flight as cancelled because she ultimately took the flight. The official provided another screenshot of United's internal software system and said that it showed the flight had been cancelled on a mobile app, though a reporter was unable to independently verify that on Saturday because of the system's coding. Jackson Lee issued a statement on Saturday afternoon saying: "I asked for nothing exceptional or out of the ordinary and received nothing exceptional or out of the ordinary." Simon said she saw Jackson Lee board the plane with a flight attendant before all of the other passengers, but did not know who she was until another passenger told her after they were seated. A mechanical problem with the plane delayed take-off and after about 50 minutes, she said, passengers were invited to consult with a gate agent about alternative flights. Simon said she went to the front and snapped a photo of Jackson Lee and told a flight attendant that she knew why she'd been bumped. In her statement, Jackson Lee said she overheard Simon speaking with an African-American flight attendant and saw her snap the photo. "Since this was not any fault of mine, the way the individual continued to act appeared to be, upon reflection, because I was an African American woman, seemingly an easy target along with the African American flight attendant who was very, very nice," Jackson Lee said in the statement. "This saddens me, especially at this time of year given all of the things we have to work on to help people. But in the spirit of this season and out of the sincerity of my heart, if it is perceived that I had anything to do with this, I am kind enough to simply say sorry." Simon said Jackson Lee's statement accused her of racism, adding: "I had no idea who was in my seat when I complained at the gate that my seat had been given to someone else," she said. "There is no way you can see who is in a seat from inside the terminal." About five minutes after Simon took the photo on the plane, Simon said, another flight attendant sat next her and asked if she "was going to be a problem." Simon said she replied that she just wanted to go home. She said the plane took off at 12:50 p.m. and she arrived home that night, still upset. Simon wrote a letter to airline's CEO and posted it on Facebook and Twitter. A "resolution manager" called her Saturday morning and apologized at least a half-dozen times, she said. She said she wants a formal, written apology from United. "It's just impossible to suspend disbelief and swallow that story that I cancelled my flight," Simon said. United has suffered a string of customer relations gaffes this year. In June, a woman said she was forced to give up her 2-year-old's $969 seat on a flight from Houston to Boston and hold him for roughly three hours because the airline sold the seat. In April, Dr. David Dao was forcibly removed from a United Express flight in Chicago to make space for crew members headed to Louisville, Ky. The airline announced policy changes after that incident and its CEO, Oscar Munoz, has promised a "culture shift toward becoming a better, more customer-focused airline."